I'm back from vacation now. 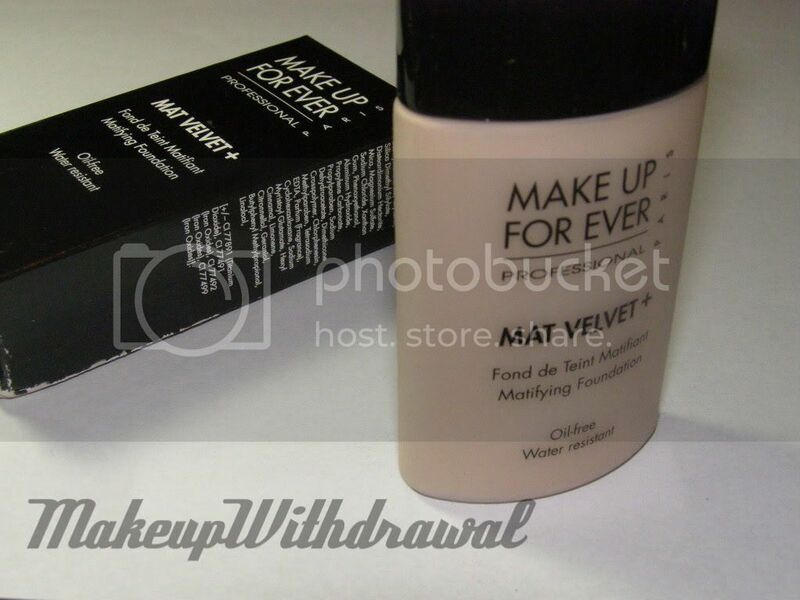 For the last month or so, I've been testing out a new foundation- Make Up For Ever Mat Velvet + Foundation. I picked shade number #30. It was the closest match under natural light but still a bit beige. The reason for buying this foundation was that I heard that it was great for oily skin- which it really is! My makeup stays intact all day and I only have to blot or repowder maybe once in afternoon. I would describe Mat Velvet + as about medium coverage with matte finish. It comes in a squeeze bottle, which I kind of like. With pumps like the HD Foundation, I could never tell how much was left and when it was going to run out. One thing I noticed about Mat Velvet + was that once I started to apply it to my skin, it dried really quickly. It's definitely a foundation that you have to work fast to apply, or it won't blend in. My favorite way to apply it is with a damp sponge, then to stipple a bit more afterwards. It's a bit time consuming, but I get a better finish than if I were to just sponge or stipple separately. There's a huge BUT statement coming, and here it is- MUFE Mat Velvet is fantastic BUT it doesn't photo well at all. That's why I didn't post a picture here with it on my face. Even though there's no physical sunscreen, there's a ridiculously bad white cast that shows up in pictures every time I use flash. It's not "Oh, my face looks pale" it's "Why do I have White-Out on my face?". So... would you like this foundation? If your skin is oily and you want something that will provide medium coverage and last all day (and your job doesn't involve lots of people taking pictures of you, then yes- I think you will love it if you can get a shade match! For drier skins though, I feel like the fast drying foundation will only make your skin worse. Make Up For Ever Mat Velvet+ is $34 for 1.01oz at Sephora. Have you tried Mat Velvet+? What did you think?